within 10 days from the notification date. They prefered Teaching Experience candidates with Fluent English. Interested candidates can send updated CV to college email or college address are given below. 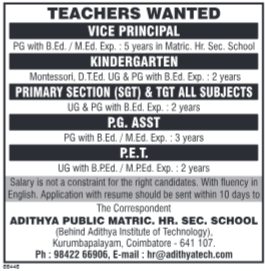 More Information refer the official website www.apms.edu.in for APMS Aditya Public Matric Higher Secondary School KGT/PRT/TGT/PGT/PET/ Vice Principal Posts. Salary, selection procedure, how to apply and important dates, are maintained below. Aditya Public Matric Higher Secondary School. Starting Date to Apply :within 10 days from the notification date. Kindergarten: Montessori, D.T.Ed. UG & PG with B.Ed. Experience 2 Years. SGT & TGT: UG AND PG with B.Ed 2 Years Experience. P.E.T: UG with B.P.E.d/M.P.E.d 2 Years Experience. Eligible Applicants can send updated CV to school email or school address are given below.